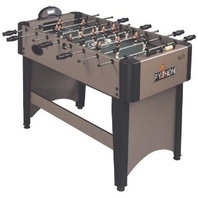 The Sportcraft Playmaker foosball table is a cheaper table made for kids with a shorter length of 48 inches instead of the standard 58. 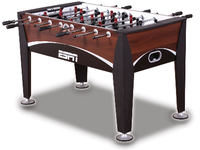 This table is designed more as a toy than an actual sport table. 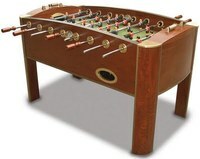 It is almost entirely made of plastic foosball parts which makes it lightweight and shaky during foosball games. 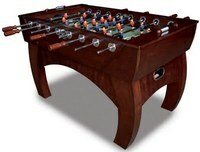 The Playmaker is not a table that you can perform advanced shots on or learn how to play competitive foosball. 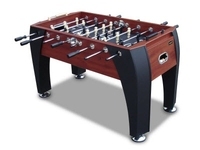 If you are looking for a table to learn all aspects of foosball, go with a Tornado brand table that are designed for tournament play. 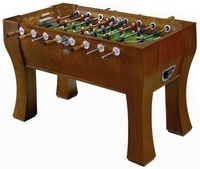 This foosball table is priced around $240 US.